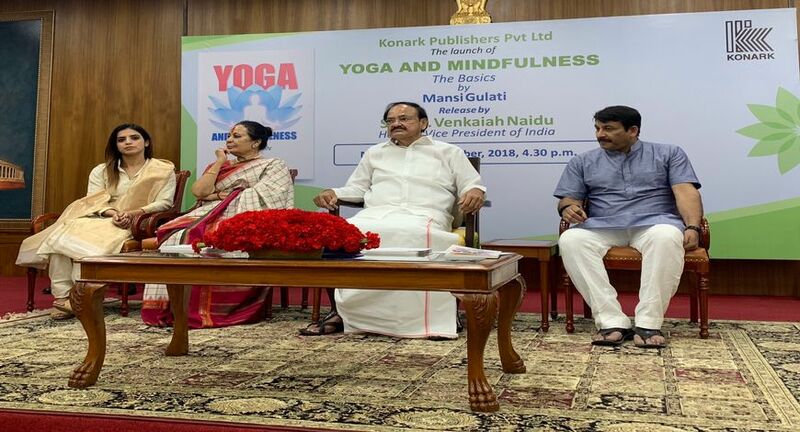 The launch of the book was done by Honorable Vice President of India, Shri M. Venkaiah Naidu amidst the presence of dignitaries like Dr. Sonal Mansingh, Shri Manoj Tewari, ambassadors and diplomats. Mansi Gulati, the yoga exponent and author launched her new book ‘Yoga and Mindfulness’ in association with Public Diplomacy Forum recently. The launch of the book was done by Honorable Vice President of India, Shri M. Venkaiah Naidu amidst the presence of dignitaries like Dr. Sonal Mansingh, Shri Manoj Tewari, ambassadors and diplomats. Mansi Gulati addressed the audience and spoke about the benefits of yoga. She said her book ‘Yoga and Mindfulness’ was the simplest study on the subject which is based on the fact that yoga is not mere asanas but everything done with mindfulness and dedication.